In the majestic sea of olive trees which fills the south of Cordoba, in the borders with Jaen and Granada, is where all our excellent and aromatic extra virgin olive oils come from. The location of our olive grove, in the heart of the subbetica of Cordoba, offers ideal climatic conditions, which alongside our artisan work gives the result of “the brightest of the liquid gold of all Spain”. The olive varieties that we cultivate in this zone, give place to oils with a diverse profile but always with magnificent qualities; Extra Virgin with DOP, virgin and olive oil, with a production that surpasses 140.000 TM. From this olive variety come EVOO’s with hints of apple and green almonds, with excellent organoleptic characteristics. A unique oil, sweet and balanced, and one of the more demanded in the world. 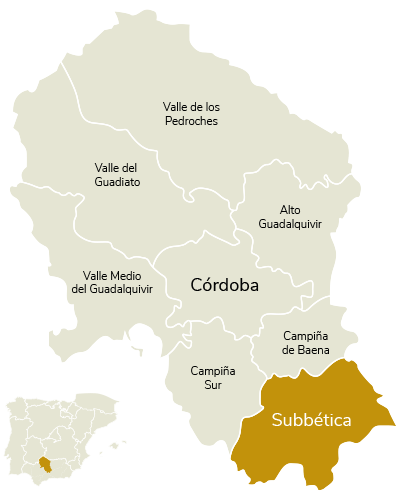 The Picuda has its own DOP Priego de Cordoba, and is the dominant variety in the region. The other of the most valued varieties. Highly present in the groves of Jaen and Cordoba, occupying more than 90% of the cultivated land of Jaen. A fruit with an early maturation, high production rate and conservation, whose juice evokes aromas of herbs, tomato and olive leafs. With a late maturation and excellent resistance to drought, the hojiblanca variety takes hold in the provinces of Cordoba, Jaen, Granada and Malaga. This olive gives aromatic and pleasant oils, with a taste of fresh fruit and a hint of green almond, herbs and a light spice taste. Olive oil is a highly appreciated product, for its quality, taste and excellent nutritional benefits; not only in Spain, but in an international level. Specifically, extra virgin olive oil prevents cardiovascular diseases by reducing the levels of LDL cholesterol, is rich in monounsaturated fats and oleic acid, has anti-cancer properties, facilitates the function of the digestive system, helps to strengthen the bones, is antioxidant and provides vitamins A, D and E.